Last season, Tennessee was a popular breakout-team pick, thanks in large part to the return of veteran quarterback Joshua Dobbs and the talent throughout the roster. However, the Volunteers opened last season with three heart-wrenching losses (Oklahoma in OT, Florida late and a rough game against the similar disappointing Arkansas Razorbacks) in the first five weeks. The Vols did figure it out, closing out the year with an 8-4 regular season mark, winning six of their last seven with their only loss coming to Alabama. The relatively disappointing regular season left Tennessee fans eager for more, and the Vols delivered in their bowl game, punishing Northwestern 45-6 in the Outback Bowl, and giving fans a sneak peek of what they would be in 2016, one of the nation's most dangerous teams. Backfield: Head coach Butch Jones lacked stability at the quarterback position early on in his tenure, but Joshua Dobbs has now made it a position of strength. Dobbs enters his senior season coming off a year in which he threw the ball for 2,291 yards and 15 touchdowns while rushing for 671 more yards. The veteran quarterback doesn't wow you as much as others with his arm strength, but he is an accurate thrower who has matured at reading defenses. 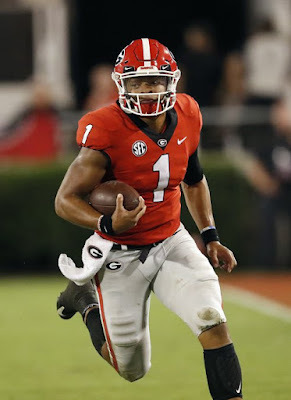 His speed and playmaking ability as a runner give defenses problems as well, and while he may not be a Heisman-caliber player, he should be one of the SEC's best entering '16. Also helping out should be a deep stable of talented backs, headlined by junior Jalen Hurd. Hurd was fabulous as a true freshman in 2014, with 899 yards, but he was even better a season ago. He picked up 1,288 yards and 12 touchdowns, and also proved to be a very valuable receiver out of the backfield. Hurd uses his massive frame, at 6'4", 240 pounds to bully opposing defenders but also is explosive in the open field, a lethal mix. 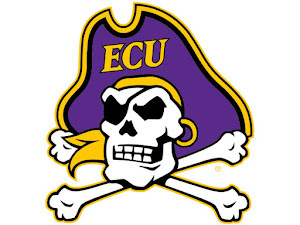 He should also enter the year as one of the conference's premier players at his respective position, after becoming the first Volunteer in school history to rush for 1,000 yards as a sophomore. Behind him is junior Alvin Kamara, who ran for 698 yards and seven scores as a backup last year. Kamara was a typical highly touted Alabama recruit a few years back, but quickly transferred to the junior college ranks, where he starred in '14, before coming on board last year. Kamara is quicker and more agile than Hurd, and he showed he can pick up yards in big chunks last season, averaging 6.5 yards per carry. The combination of Hurd and Kamara is enough to feast on opposing defenses, but Tennessee does also bring in true freshman Carlin Fils-Aime, along with sophomore John Kelly. Fils-Aime is a three-star prospect that could find himself a role, while Kelly is a solid piece to have back. Last year, despite being extremely young and the No. 3 guy, Kelly rushed for 165 yards on 40 carries. Those weapons could well give Tennessee one of the most experience and talented position groups in the SEC and entire nation. 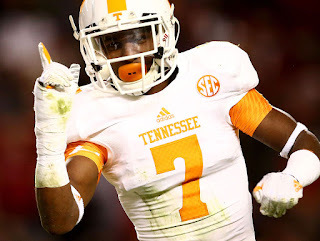 Receivers: Tennessee's receiver corps struggled last season, as injuries hit the unit hard. Marquez North missed significant time, Jason Croom tore his ACL and the team's top pass-catcher, Pig Howard, as dismissed. While that hurt Tennessee last season, it should aid them in 2016, as some young pieces gained valuable experience. With leading receiver, Von Pearson, now gone, it appears as though junior Josh Malone is the top receiving option. Malone had 31 catches for 405 yards, and proved he was very reliable throughout last year. Along with junior Josh Smith, the Volunteers have two sure-handed targets that should stretch opposing defenses and open things up for Hurd and Kamara. Sophomore Preston Williams is going to play a very increased role, after recording just seven catches a season ago. 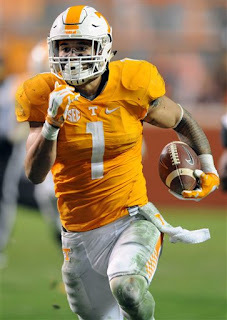 Unlike Malone and Smith, who make plays with speed and agility, Williams makes plays utilizing his great size and frame. He is 6'4", 210 pounds with great athleticism and could prove to be especially lethal in the red zone. Beyond those guys, Tennessee has a lot of upside but very little proven commodities. Junior college transfer Jeff George, sophomore Jauan Jennings and junior Will Martinez are going to see some action, even if Tennessee will primarily run the ball. Tight end Ethan Wolf has the chance to be an All-SEC playmaker this year. He had 23 receptions with 301 yards and two touchdowns and was extremely reliable. He has good speed and is a strong enough route runner that defenders will struggle to keep up with him. He will hope to become an even more effective weapon to use in the red zone, as the Volunteers could use more than just two scores from him. Also returning is Croom, who hopes to be fully recovered from injury. Croom has the versatility to play either receiver or tight end, and he has proven that he can make plays at either. In 2014, he recorded 21 receptions for 305 yards and had a huge reception late in a close game against South Carolina. Tennessee needs more consistency from their guys late in games, and Croom could be a nice asset in crucial moments. The Volunteers are expecting solid production from three-star tight ends Devante Brooks and Austin Pope, although they may struggle to lock down consistent playing time this year. Offensive Line: Winning football teams in the SEC need consistent offensive line play, and the Volunteers look like they will certainly get that this season. The unit had some major ups-and-downs last season, but still posted good numbers and return four starts in '16, with only left tackle Kyler Kerbyson departing. The left tackle position that Kerbyson does leave, could be a pretty major problem, however. Redshirt freshman Drew Richmond is a lot of people's pick to take over the starting job, but he obviously lacks much experience. JUCO pickup Dontavius Blair and four-star newcomer Ryan Johnson are the other linemen fighting for the job. Blair has a lot of people excited because of what he did at the junior college ranks, but SEC football is a whole new animal. Whoever locks down the starting gig will definitely play a pivotal role, as the conference has an abundance of pass rushers it can throw at them. Tennessee is aiming for bounceback campaigns from a couple guys that missed time last season with injury. Junior guard Jashon Robertson has proven himself more than capable, but missed some action a year ago with an ankle injury. He has the versatility to play either guard spot, and play a key role in the ground game. Fellow junior Brett Kendrick was out for the entirety of the 2015 season, but has the chance to be a beast at either guard or tackle, likely at RT. Junior Coleman Thomas was thrust into the starting role due to struggles from Mack Crowder last season, and he performed very well. Thomas isn't a great athlete, but he plays with great energy and is a solid piece in the heart of the unit. Rounding out the offensive line is going to be senior Dylan Wiesman, who is probably Tennessee's most talented blocker. Wiesman earned Second-Team All-SEC honors for his play a year ago, and he should be very effective once more. Wiesman started 12 games at right guard last season, and should patrol the spot this season. Defensive Line: Tennessee is immensely talented throughout their football team, and that is most evident on the defensive line. The Volunteers know how to get after the quarterback, racking up 30 team sacks last year and gaining the top sack percentage in the conference all the way back in 2014. They don't lose much entering this year, and are spearheaded by one of the SEC's best defenders in junior defensive end Derek Barnett. Barnett is an absolute beast off the edge, as he racked up 10 sacks and 69 tackles last season. His speed and athleticism are special, and few blockers will be able to stay in front of them in 2016. He is just one of a number of Volunteer fans that have NFL scouts very interested. However, he may not be the most talented defensive linemen on the Tennessee roster, at least in the long run. Sophomore Kahlil McKenzie has the chance to have a huge season, after showing flashes of what he could do last season. McKenzie came into Tennessee as a consensus five-star recruit and even as the No. 1 overall recruit in the nation be a couple recruiting services. He quickly overtook more experienced defensive tackles because of his strength and power, and he also brings decent athleticism for his size (6'3", 340 pounds). McKenzie is also the son of Oakland Raiders General Manager Reggie McKenzie, so he knows the game of football. He will almost certainly have a breakout sophomore season. Joining McKenzie at defensive tackle will be junior Kendal Vickers, a well-rounded defender. Vickers is a decent run defender, with 20 tackles last season, while also proving he could disrupt the quarterback. He is slightly undersized, but he still gets by because he is quick and athletic. At the other defensive end spot, Tennessee will turn to senior Corey Vereen. Vereen doesn't have the flash of Barnett or McKenzie but he is a solid pass rusher that can help out the Volunteers in a variety of ways. Vereen had 39 tackles and 9.5 tackles for loss last season, which could increase as blockers focus even more on Barnett and McKenzie. The Volunteers are going to be expecting big things from newcomer Jonathan Kongbo. Kongbo is a five-star recruit by many scouting services, and is widely seen as the best junior college transfer in the entire land. The defensive end will be immediately bring even more ferocity and punch to the position and feast in a reserve role. Linebackers: Injuries also struck Tennessee's linebacker corps last year, as pass rusher Curt Maggitt was lost after just two games. Maggitt had 11 sacks the year prior, in '14, so the loss of his talents stung. Maggitt has exhausted his eligibility now, but the Vols proved they have defenders ready to step up in his absence. One player that stepped up even more was Jalen Reeves-Maybin, who established himself as an elite defender. Entering his senior season, Reeves-Maybin is among the nation's most physical and dominant linebackers, proven by his impressive 2015 stat sheet. Reeves-Maybin led UT in tackles last year, with 105 of them (66 of them solo), 14 tackles for loss and six sacks. Playing the outside linebacker spot, Tennessee consistently lets him run wild and get after the quarterback, and he has certainly proven he can do just that. Reeves-Maybin will be helped out by the return of sophomore Darrin Kirkland. Kirkland was thrust into an increased role as a young redshirt freshman in '15, and he showed he could hold his own. Kirkland isn't quite the playmaker that either Reeves-Maybin or Maggitt are, but he is a rock-solid linebacker that is a proven tackler. Kirkland recorded 66 tackles, with 6.5 of them going for a loss, while also displaying his abilities as a coverage option. Loads of young talent arrives as reinforcements in this recruiting class, especially Daniel Bituli. Bituli is a high-upside player out of Nashville rated as a four-star find. Fellow newcomer Ja'Quain Blakely was a great pickup from Georgia who the Volunteers see as a potential superstar down the road. Secondary: Tennessee had some serious ups-and-downs defending the pass last season, but they return enough heading into 2016 that the secondary should be a significant strength. Star cornerback Cameron Sutton flirted with the NFL, but instead opted to return for his final year with UT. Sutton is a huge returner, not only at corner, but also at special teams. At cornerback, Sutton has proven that he can help the defense in run support or in coverage. He had six pass deflections and one interception last season, but many opponents were scared to test him, those numbers may very well increase. Sutton is extremely experienced and knows how to play winning SEC football (94 career starts), which is big because the unit is still fairly young. Sutton will be joined by fellow senior Malik Foreman, who is back to lead the nickelback spot. Foreman was inconsistent at the role last season at times, but still had an overall successful campaign. Playing the nickelback, Foreman will have a variety of duties and will have to make different plays. He has proven his abilities in coverage (nine pass breakups in 2015) and could be a sneaky pass rusher. Also back at cornerback for Tennessee is junior Justin Martin, who was solid last season. Martin is yet another former junior college transfer (coming from Northeast Oklahoma A&M) who has proven to play a pretty important role for the Vols. Martin is still pretty young and learning the ropes, but he has proven he can be a very nice help in coverage. The safety positions are going to be interesting for Tennessee. Strong safety Brian Randolph and free safety LaDarrell McNeil both depart. Randolph is an especially tough player to replace, as he was second on the team in tackles, with 70 this past year. Replacing him at SS is likely going to be sophomore Rashaan Gaulden, who was out for the year in 2015. Gaulden has proven himself capable, as he was very good as a true freshman. However, it remains to be seen how effective he will be coming off a painful foot fracture. The free safety position is likely going to be given to junior Todd Kelly, although he will face some stiff competition. Kelly had 46 tackles in a reserve role last season, and UT will need his playmaking prowess. Expect junior Evan Berry to play a pretty large role in the defensive backfield, even if he doesn't start. Berry is the younger brother of former Vol and current Kansas City Chief Eric Berry; a guy who may go down as one of Tennessee's best defenders in history. Evan was inconsistent last season, but he still can lay down big hits like his older brother. Special Teams: Tennessee could have one of the SEC's best special teams units. Junior Aaron Medley is back at kicker, while Trevor Daniel returns at punter. Meanwhile, the return game should be wonderful thanks in large part to the return of Sutton, Berry and Alvin Kamara. Sutton broke Bobby Majors' punt return record (he had 457 punt return yards all the way back in 1969) with 467 yards, while Berry was the SEC special teams Player of the Year as a kick returner. This is the year for Tennessee. They were talented enough that they could have broken out last year, but injuries and poor luck contributed to some disappointment, although they shouldn't feel bad about nine wins. This season, with Dobbs and Hurd back, along with an extremely talented defense, there is no excuse for UT to not be in SEC title contention, and much more. The schedule favors them; their toughest opponents, Florida (who they haven't beat in years) and Alabama, they get at home, and don't get any huge non-conference tests. The SEC East has consistently underachieved when compared to the Western Division, but it is up to Tennessee to change that. If they are able to find consistency and close out the late games they didn't in 2015, a College Football Playoff berth and SEC title aren't out of the question.